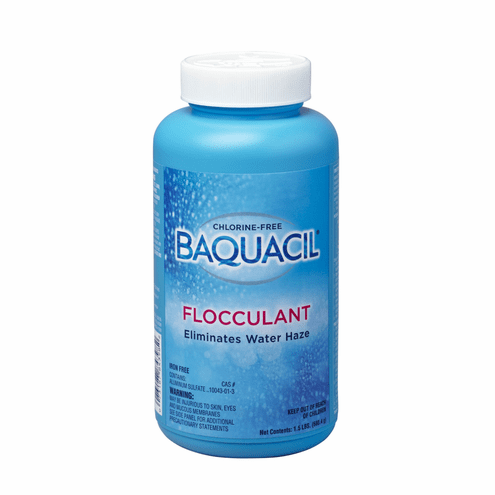 Baquacil Flocculant clears cloudy water haze. It is an iron free formula that uses aluminum sulfate to clear the haze in your pool water like no other can. Check to ensure filter pressure is no more than 8psi above the normal. If it is backwash before using flocculant treatment. Raise water level to just below top of skimmer box. Shut off the filter system. Dissolve Flocculant in a bucket of water and broadcast the solution evenly over the surface of the pool. Do not use pool for 24-48hrs, allowing the floc to settle to the bottom of the pool. Vacuum the waste settled to the bottom. Turn filter system back on.